Healing Waters Lodge and Lewis & Clark Expeditions Smith River fly fishing trips depend on water, of course. 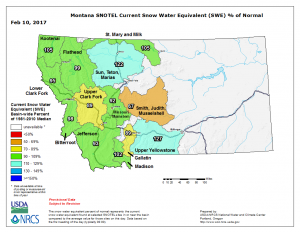 Online, we follow the abundance of information posted on the Montana Natural Resource Conservation Services Snow Survey site. The information is gathered by the NRCS National Water and Climate Center and other monitoring organizations and placed on this site in a way that is visual and understandable to users. We keep an eye on conditions to help predict what kind of season to plan for and answer questions for our clients. Healing Waters Lodge is located in southwest Montana in an area with a huge agricultural and ranching industry dependent on water. 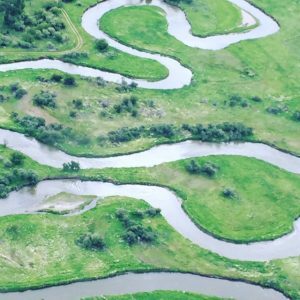 As a business, we are just a small conservation-minded fish in the big pond of water resource users, but, as an industry (lodging and guided fly fishing) we have a huge stake with other water resource users. State and federal government agencies use this data to monitor resources, plan allocation of resources, plan conservation and restoration projects, drought and fire monitoring, forest health and so forth. It is our good fortune to be involved, along with our colleagues, industry competitors, and local landowners; with our local chapter of Montana Trout Unlimited, local Montana Fish Wildlife & Parks Fisheries Biologists, US Forest Service biologists, and conservation organizations such as the Montana Land Reliance, Beaverhead Watershed Committee, and Big Hole Watershed Committee just to name a few. For our purposes, the Snow Pack Survey data indicates that we can anticipate an average water season. We hope for a cool, wet spring and rain showers when we need them the most throughout the summer. It is looking good for the fish under the big sky in southwest Montana. The man with a plan for your fly fishing vacation is Mike Geary (aka Mr. Big) and he can be reached by cellphone, 406-459-2030, twenty-four/seven.